We have lots of exciting news and updates for you all. This week has been very busy, but very successful for Douglas J Green Memorial Foundation. 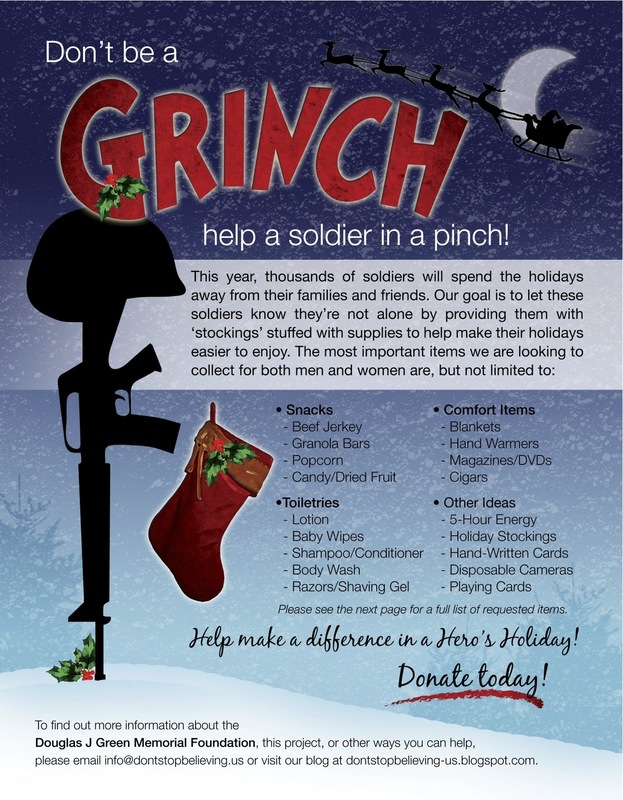 We kicked off our first fundraising event, “Stuff a Stocking for a Hero” on Wednesday, November 16 and have had a huge response from the community already! 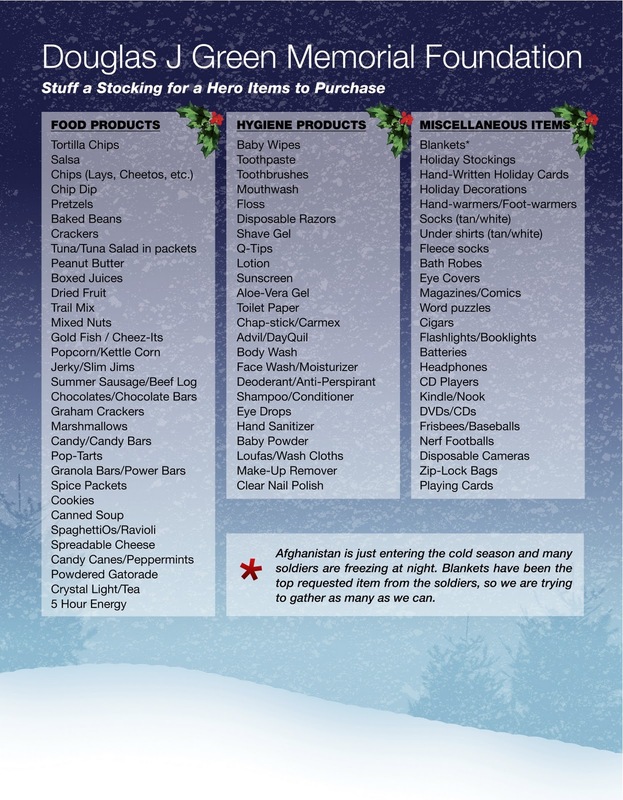 For the fundraiser we have been asking volunteers to put bins and boxes in their place of business, school, gym, or other organizations in their community to collect certain goods to send over to the soldiers for the holidays. A lot of men and women don’t have the privilege to sit down with their friends and families during the holidays, open gifts, enjoy the holiday cheer, a warm fire or a nice place to sleep at night. Instead, they wake up in an outpost, throw on their gear, and go out to serve and protect like they do every other day. Especially during this time of year, we wanted to send a little piece of home during the holidays to bring a smile to a soldier’s face and let them know they’re not alone. Our friend Nick Caracciolo put together an amazing flyer for the event (below), and we already have over 40 boxes out around the Northern Virginia area and expect to have a few more over the next week! 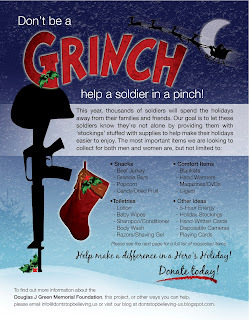 Our goal is to send out at least 100 packages to soldiers, so please join us in our efforts to collect goods and reach this goal. Participating Organizations – THANK YOU! If you would like to participate in this fundraiser by donating items, please drop them off at one of the retail locations above, or contact any of the girls of Douglas J Green Memorial Foundation and we will be more than happy to arrange to meet with you. We can always be reached at info@dontstopbelieving.us. This week, our friend Mrs. Ryman, an English teacher at PFHS, hooked us up to meet with the Senior Class Sponsors at Potomac Falls, Leah Andaray and Jacquie Phillips. The Senior Advisory Board has chosen to work with DJGMF as part of their Senior Class Project and we are super excited to have them on board! 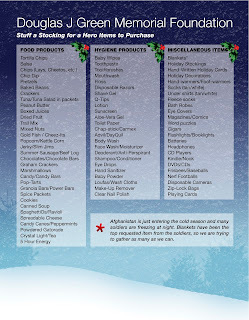 They will be working with us very closely for the “Stuff a Stocking for a Hero” holiday event by collecting goods and coming to the packing day to help pack up boxes. All 50 students on the Senior Advisory Board will be in attendance and we are so happy to have the helping hands. We plan on meeting with the Student Advisory Board on December 1 and December 7 to brain storm more ideas of how we can work together to support the cause. When we met with them this week, they had already started working on some great ideas and we will be sure to keep you all informed as these ideas become concrete. Thanks so much PFHS and the Senior Class! On Saturday, December 3rd from 3:00-11:00PM, Kellie, Krissy, Alicia and Suni will be guest bartending at Buffalo Wing Factory in Ashburn, VA to raise funds on behalf of DJGMF. All tips we make and 10% of food sales that we bring in will all go towards the foundation. Nick, who is our go-to–guy for all of our flyers, is also an amazing DJ and we will be bringing him with us! So whether you want to bring your family in to grab some wings or you want to come drink some beer and listen to great music, Buffalo Wing Factory will be the spot for the night and it all goes to a great cause! Come join us! We will have a Facebook event up soon, but please save the date and spread the word. As Derek and Alex continue to work on our website, we plan to have an official Facebook page up within the next week to keep you all updated with events and share some cool stories with everyone. Doug’s friend, and our friend, Andrew Schrader, has been passing along great advice as far as social media is concerned and we plan to incorporate multiple avenues to keep you all informed. All of you out there who live by Facebook and Twitter, keep your eyes open because we’ll be on your page soon! We will also be making some changes to our blog in the near future, but that one we will have to keep a surprise! As always, if any of you have any thoughts or ideas as far as ideas for events or fundraisers, please let us know! Also, as we work through our first couple of fundraisers, if you have any comments about how we’re doing or what we could be doing better, we would absolutely love your feedback. We look forward to hearing from you guys, but in the meantime don’t stop believing!